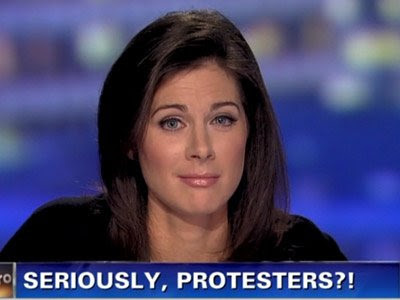 Erin Burnett, CNN reporter, took on the Occupy Wall Street movement on Monday. Photo courtesy of peopleunlikeus.com. Over the past two weeks, the Occupy Wall Street movement, which began with a small group of a few dozen disaffected youngsters camping out in Liberty Square to a larger-scale movement that has spawned gatherings in other cities and has gained the support of several large New York City unions. The nature of the protest may have changed over the course of two weeks, but one constant has been the complete lack of unbiased reporting about the movement. This particular segment is painful to watch not only because of the contempt with which Burnett treats the entire enterprise, but because it demonstrates just how low the standards of "journalism" are in the United States these days, particularly television journalism. (And yes, I know that print journalism has been far from fair in its coverage of the protests; check out this charmingly dismissive article by none other than Ginia Bellafante, who you may remember as the woman who thinks that all women hate fantasy.) To me, mainstream television journalism has foregrounded entertainment at the expense of actual reporting. That's why the supposed "most trusted name in news" is instead presenting us with a poor knockoff of "Really!?! With Seth and Amy." The major difference here is that Saturday Night Live - like its similarly sarcastic brethren The Daily Show and The Colbert Report - is not trying to present journalistic facts (although these shows often manage to present a story better than their non-comedic equivalents). The point of the sketch is to make people laugh. I don't watch CNN for its comedic value, I watch it because I want to be informed about what is going on in the world. It has taken me the full length of the Occupy Wall Street protests to get a grip on what is actually happening, because any news source that I turn to is either condescending and critical or radically reactionary. I had to wait until the protests got big enough to be covered by the BBC to find a single news source that just gave me the facts about the protest rather than shoving the reporter's opinion down my throat. Thomas Jefferson is quoted as saying "were it left to me to decide whether we should have a government without newspapers or newspapers without a government, I should not hesitate a moment to prefer the latter." Jefferson saw a free and open press as the guardians of democracy, the institution that kept the government in check by asking the questions that no one else could ask. American citizens of all political affiliations are asking questions; they want to know why financial executives are not being punished, why unemployment is so high, and why we're still in a recession even after the bailout. The press is supposed to be asking these questions. Instead, they can't even properly report on the people who so desperately want answers.